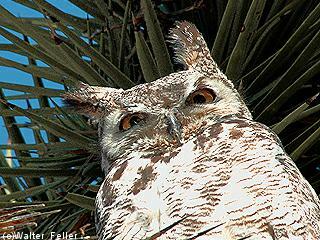 A very large owl with adults posessing large ear tufts, a reddish face, a white patch on the throat and yellow eyes. The ear tufts are not actually ears, but just tufts of feathers. The underparts are light with brown barring; the upper parts are mottled brown. The legs and feet are covered in feathers up to the talons. Their breeding habitat is almost anywhere across North America and parts of South America. They are often found in urban and suburban settings and are a common backyard bird. They often take over a nest used by some other large bird, sometimes adding feathers to line the nest but usually not much more. In the Sonoran desert, they often take over abandoned red-tailed hawk nests in the arms of saguaro cacti. In the Mojave desert, in the branches of a Joshua tree. They are permanent residents, but may wander after the nesting season. These birds hunt at night by waiting on a high perch and swooping down on prey. They mainly eat small mammals such as rats, mice, rabbits and skunks, as well as small birds, including smaller owls. In northern regions, they may let uneaten food freeze and then thaw it out later using their own body heat. They have excellent hearing and exceptional vision in low light. Compared to humans, owls have a much sharper depth of perception to their hearing. This is possible because owl ears are not placed in the same position on either side of their head: the right ear is typically set higher in the skull and at a slightly different angle. By tilting or turning its head until the sound is the same in each ear, an owl can pinpoint both the direction and the distance to the source of a sound. A common, permanent resident throughout the state from sea level to 2100 m (0-7000 ft), occasionally to 3200 m (10,500 ft). Exploits a variety of forests with meadows and other openings, extending from valley foothill hardwood to mixed conifer habitats. Commonly feeds and breeds in riparian, conifer, chaparral, and desert habitats. Feeding: Usually makes low, rapid flight from perch to capture prey on ground. Rabbits, rodents, and other small to medium-sized mammals usually make up 90% of the diet. Also eats birds (occasionally smaller or young raptors; Wiley 1975b), amphibians, reptiles, fish, and arthropods. Frequently forages in meadows and woodland or forest openings, or along edges. Cover: Requires trees with dense foliage for roosting; often uses thickly wooded canyons. Reproduction: Nests in abandoned hawk, crow, raven, or squirrel nest, in cave or crevice, on cliff ledge, occasionally in snag or tree cavity (Call 1978). Nests in trees usually 12-21 m (40-70 ft) above ground. Water: Most water requirements probably met from prey (Bartholomew and Cade 1963). Will drink water in captivity. Pattern: Frequents forested habitats; feeds especially in edges, openings, and meadows. Activity Patterns: Yearlong, nocturnal and crepuscular activity. Seasonal Movements/Migration: Mostly not migratory, but will move upslope and downslope in response to weather conditions. Home Range: In Wyoming, home range varied from 1.2 to 2.9 km� (0.4 to 1.1 mi�), with an average of 2.1 km� (0.8 mi�). In eastern Oregon, home range averaged 12.1 km� (4.7 mi�). In Michigan farmland, nesting density varied from 0.04 to 0.08 pair per km� (0.1 to 0.2 per mi�), and wintering density varied from 0.12 to 0.15 individuals per km� (0.3 to 0.4 per mi�) (Craighead and Craighead 1956). Territory: Average territory was 65 ha (160 ac) in oak habitats in Kansas (Fitch 1958). Male defends territory throughout breeding season more aggressively than female. Reproduction: Breeds from mid-January through June, peak usually March through May. Clutch size 1-6; average 3; often laid in February or March. Incubation 26-35 days, semialtricial young fledge in 35-56 days. Male may assist with nest activities. Craighead and Craighead (1956) reported fledging success (young fledged/eggs laid) of 27% and 50% in Michigan, and 89% in Wyoming. Niche: Golden eagles and humans may be the only predators (Hoechlin 1976). Competitors for food include Cooper's hawks, American kestrels, and other large owls. Population numbers respond to prey abundance. The Great horned owl is a raptor. For more information on raptors, click here. Bartholomew, G. A., and T. J. Cade. 1963. The water economy of land birds. Auk 80:504- 539. Bent, A. C. 1938. Life histories of North American birds of prey. Part 2. U.S. Natl. Mus. Bull. 170. 482pp. Call, M. W. 1978. Nesting habits and survey techniques for common western raptors. U. S. Dep. Inter., Bur. Land Manage., Portland OR. Tech. Note No. 316. 115pp. Craighead, J. J., and F. C. Craighead, Jr. 1956. Hawks, owls and wildlife. Stackpole Books, Harrisburg, PA. 443pp. Fitch, H. S. 1947. Predation by owls in the sierran foothills of California. Condor 49:137-151. Fitch, H. S. 1958. Home ranges, territories, and seasonal movements of vertebrates of the Natural History Reservation. Univ. Kans., Lawrence. Publ. Mus. Nat. Hist. 11:63- 326. Grinnell, J., and A. H. Miller. 1944. The distribution of the birds of California. Pac. Coast Avifauna No. 27. 608pp. Guiguet, C. J. 1960. The Birds of British Columbia (7). The owls. Brit. Col. Prov. Mus., Vancouver. Handb. No. 18. 62pp. Harrison, C. 1978. A field guide to the nests, eggs and nestlings of north American birds. W. Collins Sons and Co., Cleveland, OH. 416pp. Hoechlin, D. R. 1976. Development of golden eaglets in southern California. West. Birds 7:137-152. Karalus, K. E., A. W. Eckert. 1974. The owls of North America. Doubleday Co., Garden City NY. 278pp. Marti, C. D. 1974. Feeding ecology of four sympatric owls. Condor 76:45-61. Murray, G. A. 1976. Geographic variation in the clutch size of seven owl species. Auk 93:602-613. Wiley, J. W. 1975b. Relationships of nesting hawks with great horned owl. Auk 92:157-159. Click here for more information on strigiformes (nocturnal birds of prey).